The original programming model for Windows Azure applications was to use Cloud Services (originally known as Hosted Services, but still the same thing). Of particular note, Cloud Services run on VMs with disks that are not-persistent – you can write data locally (some pointers here), but any locally stored data is not guaranteed to stick around. This is a powerful model for some scenarios, especially highly scalable applications. Another feature of Cloud Services has always been that it comes with an emulator you can run locally – on your laptop at 30,000 feet was a common way to hammer home the point. 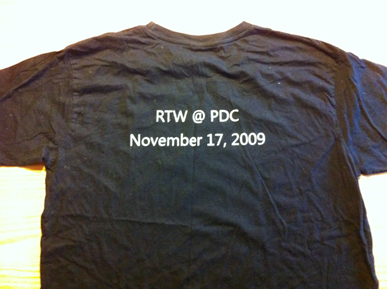 (Remember, Cloud Services were announced in 2008 – a long time before we had wifi on airplanes!) 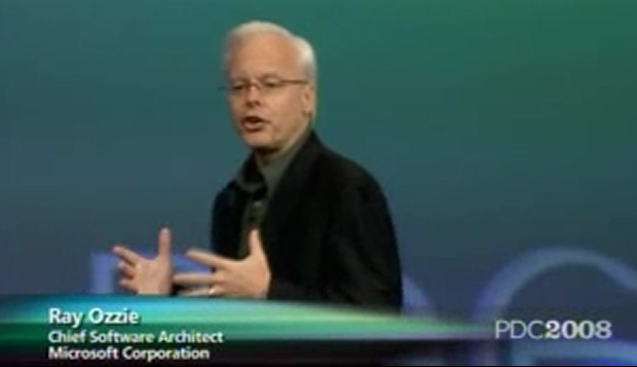 There are actually two emulators: Compute – which emulates the Cloud Service model by supporting Web Role and Worker Role abstractions, and Storage – which emulates Blob, Table, and [Storage] Queue Services. The rest of this post will focus specifically on the Storage Emulator. 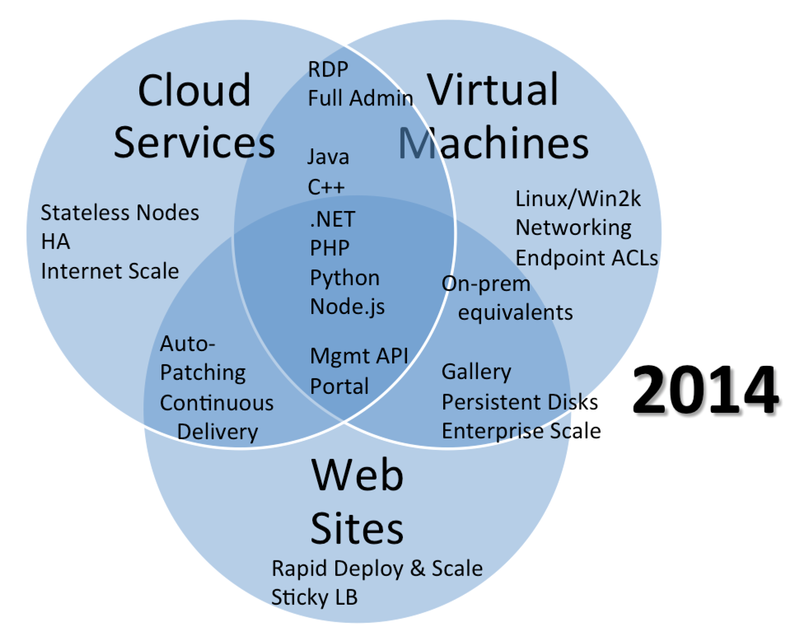 Since their announcement in 2012, Windows Azure Web Sites and Virtual Machines have been taking on many of the common workloads that used to require Cloud Services. This diagram at least conceptually should capture the sense that the when to use which model decision has become blurred over time. This is good – with more choice comes the freedom to get started more simply – often a Virtual Machine is an easier onramp for existing apps, and a Web Site can be a great onramp for a website that adheres to some of the well-known programming stacks running on PHP, ASP.NET, Python, or Node.js. If you are a big success, consider upgrading to Cloud Services. Notably absent from the diagram is the Storage Emulator. It should be in the middle of the diagram because while the local storage emulator is still useful for Cloud Services, you can also use it locally when developing applications targeting Windows Azure Web Sites or Virtual Machines. This is awesome – of course, it will be popular to create applications destined for Windows Azure Web Sites or Virtual Machines that take advantage of the various Storage Services. So that’s the trick – be sure to take advantage of the Storage Emulator, even when you are not targeting a Cloud Service. You need to know two things: how to turn it on, and how to address it. If you create a regular old Web Site and run that in Visual Studio, the Storage Emulator is not turned on. Visual Studio only turns on the Storage Emulator for you when you debug using a Cloud Service, but this is not convenient. Run csrun.exe with the parameter /devstore:start which indicates to start up the Storage Emulator. Done. Of course you might want this is a bat file or as a PowerShell function. The other part is knowing how to set up your Storage Connection String so that it accesses local storage emulator instead of the cloud. A comparison of emulated and cloud storage services is also available. There are some differences. This entry was posted in Programming and tagged #StupidAzureTricks, blob-storage, cors on February 28, 2014 by Bill Wilder. In the most recent Stupid Azure Trick installment, I explained how one could host a 1000 visitor-per-day web site for one penny per month. Since then I also explained my choice to use CORS in that same application. 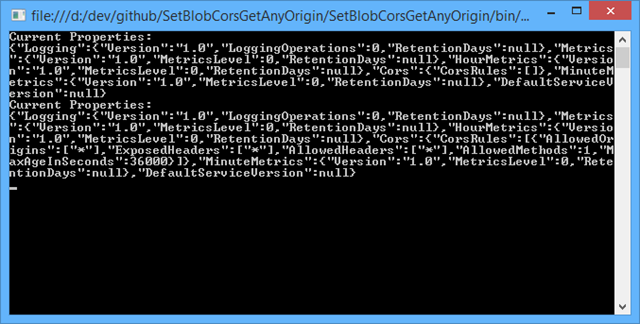 Here I will dig into specifically using CORS with Windows Azure. I also show how the curl command line tool can be helpful to examine CORS properties in HTTP headers for a blob service. I was only reading files from the Windows Azure Blob Service. When just reading, pre-flight request doesn’t matter when you are just reading. 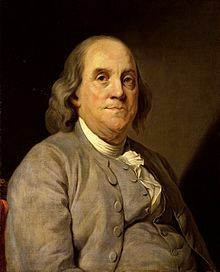 Simplification #1. I didn’t care whether the blob resource is publicly available, rather than just available to my application. So the CORS policy was to open to any caller (‘*’). Simplification #2. Yes, this is a very simple API. 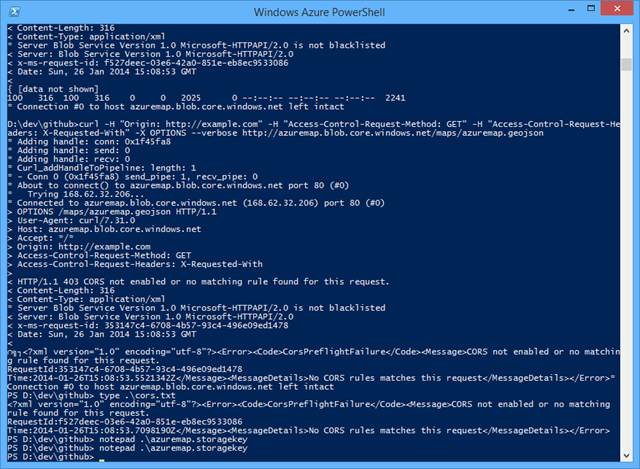 < HTTP/1.1 403 CORS not enabled or no matching rule found for this request. <?xml version=”1.0″ encoding=”utf-8″?><Error><Code>CorsPreflightFailure</Code><Message>CORS not enabled or no matching rule found for this request. 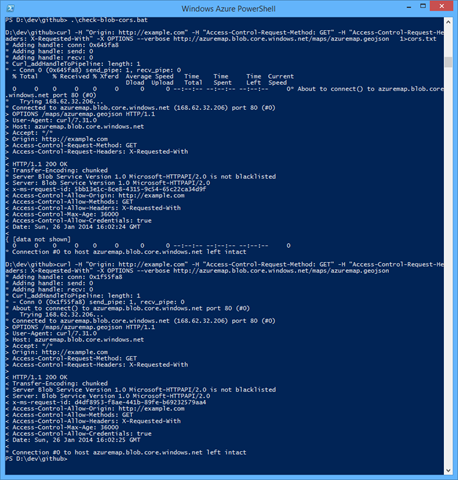 A new version of the Windows Azure Storage Emulator (v2.2.1) is now in Preview. This release has support for “2013-08-15” version of Storage which includes CORS (and JSON and other) support. This entry was posted in Programming and tagged #StupidAzureTricks, blob-storage, cors on February 21, 2014 by Bill Wilder. I recently created a very simple client-only (no server-side code) that loads needed data dynamically. In order to access data from another storage location (in my case the data came from a Windows Azure Blob), the application needed to make a choice: how to load the data. All 3 options effectively work within the Same Origin Policy (SOP) sandbox security measures that browsers implement. If access is not coming from a browser (but from, say, curl or a server application), SOP has no effect. SOP is there to protect end users from web sites that might not behave themselves. Option 1 would be to basically have a hardcoded script tag load the data. One disadvantage of this is put perfectly by Douglas Crockford: “A <script src="url"></script> will block the downloading of other page components until the script has been fetched, compiled, and executed.” This means that the page will block while the data is loaded, potentially making the initial load appear a bit more visually chaotic. Also, if this technique is the only mechanism for loading data, once the page is loaded, the data is never refreshed, a potentially severe limitation for some applications; in the very old days, the best we could do was periodically trigger a full-page refresh, but that’s not state-of-the-art in 2014. Option 3 would be to load the data asynchronously using CORS. This offers essentially the identical user experience as option 2 and also relies on the XMLHttpRequest object. JSONP is not based on any official standard, but is common practice. CORS is a standard that is supported in modern browsers and comes with granular access policies. As an example, CORS policies can be set to allow access from a whitelist of domains (such as paying customers), while disallowing from any other domain. The following summary compares key qualities. Granular domain-level security no no yes In any of the three, you could also implement an authorization scheme. This is above and beyond that. Is it the future no no yes Safer. Granular security. Standardized. Max efficiency. Yes, my simple one-page map app (described here) ended up using CORS. In large part since it is mature, and the browser support (see below) was sufficient. Reloading Browser Pages: In debugging, CTRL-F5 is your friend in Chrome, Firefox, and IE if you want to clear the cache and reload the page you are on. I did this a lot as I was continually enabled and disabling CORS on the server to test out the effects. Overriding CORS Logic in CHROME: It turns out that Chrome normally will honor all CORS settings. This is what most users will see. Let’s call this “civilian mode” for Chrome. But there’s also a developer mode – which you enable by running chrome with the chrome.exe –disable-web-security parameter. It was initially confused since it seemed Chrome’s CORS support didn’t work, but of course it did. This is one of the perils of living with a software nerd; my wife had used my computer and changed this a long time ago when she needed to build some CORS features, and I never knew until I ran into the perplexing issue. 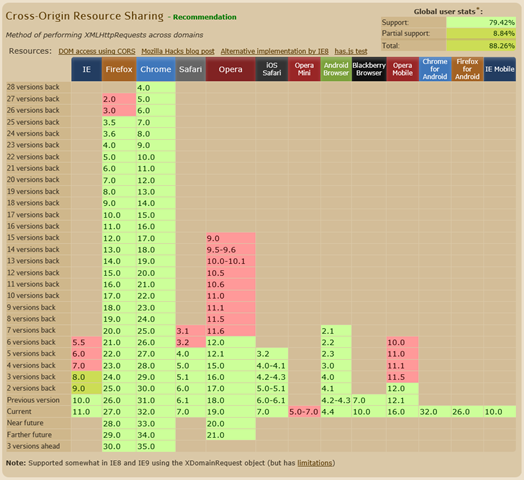 To understand where CORS support stands with web browsers, this fantastic site http://caniuse.com/cors offers a nice visual showing CORS support across today. A corresponding chart for JSONP is not needed since it works within long-standing capabilities. My simple one-page map app is described here. That page includes a link to a running instance and its source code is easily viewed with View Source.